Create a cupcake tower or set a deliciously sweet treat at each guest place setting with these personalized cupcake favor boxes. Custom printed with two lines of text. Choose from assorted imprint colors and personalization options to match the theme of your shower. 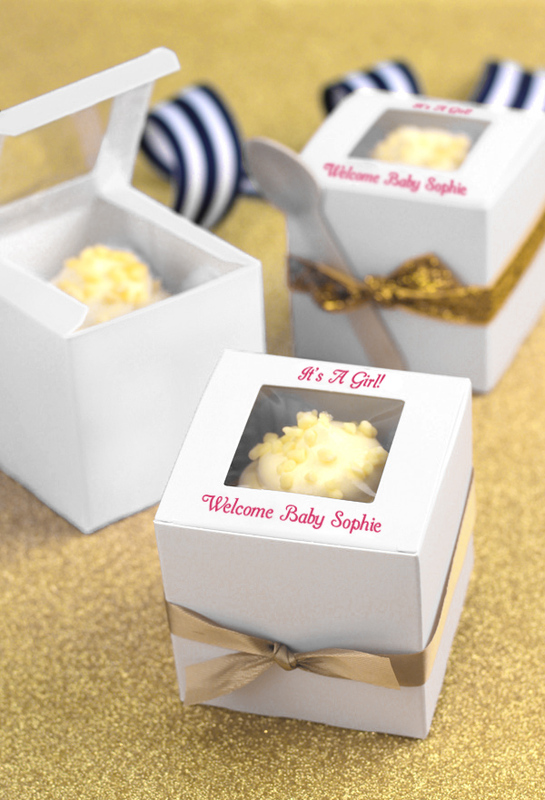 Create a cupcake tower or set a deliciously sweet treat at each guest place setting with these personalized white cupcake favor boxes. Custom printed with two lines of text. My baby shower is in July but the cupcake boxes are extremely elegant and beautiful. When I decided to edit my order, the representative was very helpful, professional and courteous. Would recommend them always. The favor boxes were perfect. Nicely wrapped, the contact at Tippy Toad was very helpful with answering my additional questions. Quick responses too! Then I bought the tiny "Nothing Bundt Cakes" & placed in boxes.